Leon Kocjancic comes from Skofije in Slovenia’s coastal region. He was chosen to spend his summer of 2015 at CINECA in Bologna to work on a project Exploring Mars Surface. Leon studied at the University of Ljubljana at the Faculty of Electrical Engineering and is now completing his Master’s thesis in antenna simulation and optimization. Leon is currently working as a student researcher in the Radiation and Optics Laboratory at the Faculty of Electrical Engineering in Ljubljana. He is involved in projects regarding microwave technology, antenna optimization, and optical communication. He has a strong belief that simulations can simplify engineering design processes and bring more technologically advanced products to the market. His first step in high-performance computing was taken during PRACE Autumn School in 2013, which was oriented towards industry high-performance computations. Ever since that moment Leon convinced that HPC is highly beneficial for technological and scientific advancement. He regards this field as an important one and will continue to pursue his PhD in the field of computational electromagnetics for telecommunications engineering. His project will take place at the Italy’s computational center CINECA in Bologna and will include 3D visualization of post processed data of Mars surface. Data was gathered with ESA’s spacecraft Mars Express that carried MARSIS radar payload. It is designed to probe the interior of Mars to look for ice and water. Simulations with this data make it possible to use automated procedures to detect subsurface interfaces that will be visualized in Blender and Paraview. Leon will benefit a lot during the project at CINECA and will gain a lot of experience in supercomputing. He is also eager to make new friends, discover the culturally rich province of Emilia-Romagna, and taste delicious Italian sweets – especially the chocolate ones. 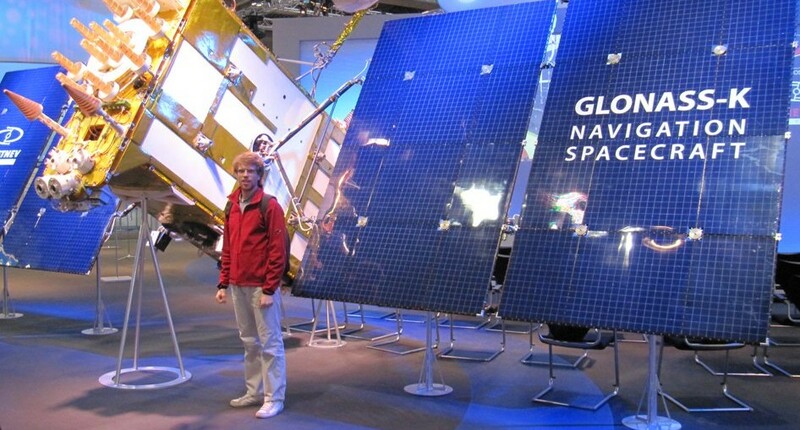 Leon with GLONASS navigation satellite at CeBIT in Hannover.